The first thing one does in Asian art is throw out all you know about Western geometric perspective. Ok, that’s easy. I know very little. In Eastern art, the idea is convey a thought with as few strokes as possible. One needs to stay loose. These are two things that are very important to me in my art now. I want my art to be looser and I want my strokes to convey an emotion, a feeling. Not just sit there and be stiff. Additionally, in Japanese Inks, the whole story fits on the page, but not using the perspective we are familiar with. It is more a bird’s-eye view. Another interesting aspect of Eastern art is how it is signed. For centuries in Asian cultures, a “chop” has been used to sign things from art to banking. Many people will have a chop for banking, one for business and another for personal use. Traditionally, the chop is done in red and white, representing yin and yang. The red is the yin, dark, feminine; and the white, the light, male, yang. Most of you are probably familiar with the yin/yang symbol. It represents the balance of the universe, male and female. A person’s initials or name is made into a symbol called the chop. Then the characters are written out by a calligrapher and finally carefully carved into a stamp. I definitely do not want to be represented by something negative or silly. So I am working on making a design out of my initials. The chop I used in this piece is my first attempt at creating a chop. I will be further refining it and using red and white to stamp it next time. I created these flowers with some wonderful brushes Karen made for us for this class. They are watercolors. I am very challenged when it comes to working with watercolors in Painter. But, I’m pleased with my first real attempt in these flowers. 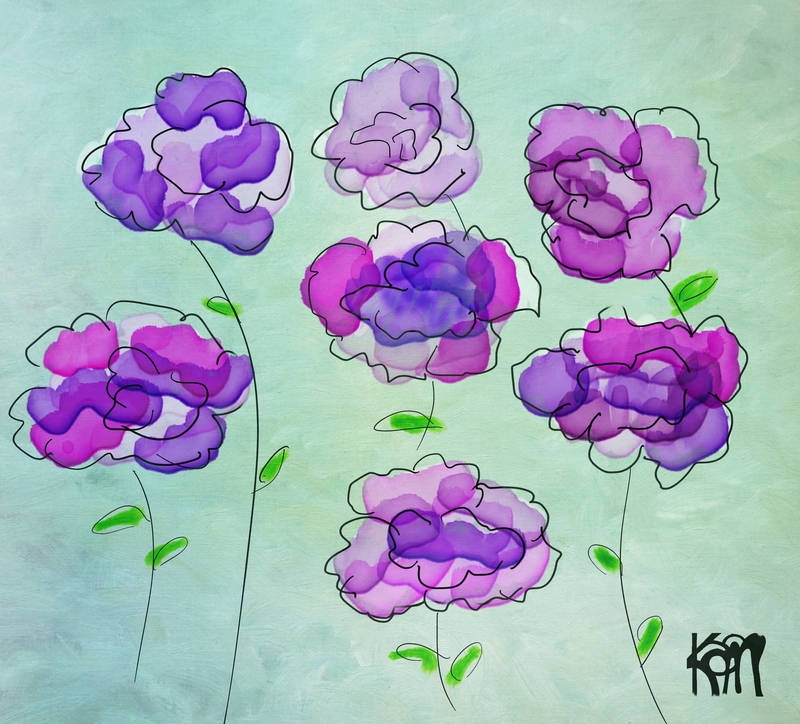 I started by just laying down violets and purples with a fairly straight-forward watercolor brush. Then I took a black pen and tried my best to stay loose while at the same time defining the flowers. To finish the piece, I brought a texture into Painter. Then, I used masking to clear some of the texture color off the flowers. All in all, this has been a fun practice for my upcoming class. This sounds like so much fun! Maybe someday I’ll get into digital art. Right now, I’m in knee-deep homework! I’m so glad that you feel better! Asian art sounds like it could be both fun and challenging. Heather, this class was so much fun. It really challenged me to keep my painting simple and I didn’t do things as simply as I wanted. But it definitely has helped me. Congratulations Kerry – lovely painting too! Congratulations on your 100th post and for putting Mrs. Negative in her place! I look forward to reading more about your new classes. Thanks, Trisha. I’ll keep blogging about the classes. Wow! 100 blogs? Kerry, that is so great. I recall when either of us could barely read 30 lines of an email–never mind write 100 blogs. Well done. LOVE these flowers, and LOVE your idea of putting Mrs. Negative Voice on a time out. Very funny–and effective. Hi Carole, you’re one of my most loyal readers. Yes, we have come a long way together. Congrats on 100! Can hardly wait to see what you learn from Karen. Looks like a great start before even beginning the Class! Have fun with it! Congratulations, Kerry, on your 100! You do a great job! Thank you so much. Fabio. Hi Jill. Thanks. They’re something new for me.